Anyway, Trish was glad to have had the opportunity to join we OHs for lunch and to recall all the happy memories she treasured as a young girl occupying No.1 Castle Street with her father. Those of us who in turn remember her with her dog Trigger, were equally delighted to relate to Trish our own recollections of HCS and that of her dad. 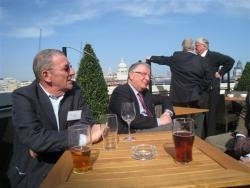 Because of the exceptionally warm weather for the time of year, we were able amid the sunshine to enjoy panoramic views across the river to St. Pauls Cathedral and the City skyline beyond. Ray Follis., DFC ( OH 1935 – 1940 ) It’s also worth mentioning here that we OHs were pleased to welcome Mr Michael Follis, 2nd son of the late Rev. 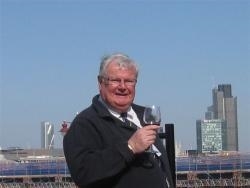 Ray Follis to this event. Although MF is not an Old Herefordian himself, he was happy to represent his father. 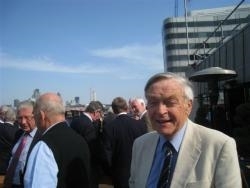 That’s because Ray, before he died only in January 2012 aged 93, had planned to attend our casual buffet luncheon himself last November. Owing to his deteriorating condition though, he sadly had to decline the invitation at the last hour. 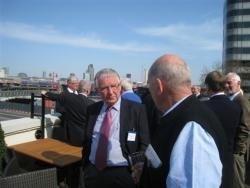 Anyone wishing to find out more about OHiL and our regular gatherings in The Capital can now visit our own website www.ohil.org.uk. 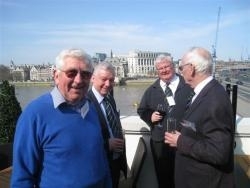 Alternatively, please contact Peter Fairman-Bourn for more details about the next riverside reunion. 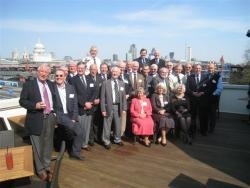 Group shot taken on terrace showing Dome of St Paul’s as backdrop with the ‘Gherkin’ building to the right skyline. 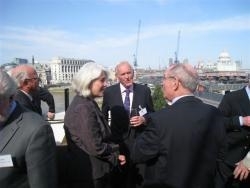 L to R: Kenneth Masters (spectacles); Claire Morgan-Jones; Peter Carter; Derek Wintle. Special guest Michael Follis flanked by Mike Moreton (L) and David Bland. 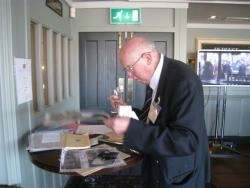 Michael P. Moreton (80) closely examining old photographs. 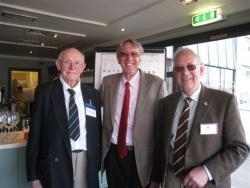 Peter Broome with Howard Griffiths. L to R: Mik Kedge; Pugh Phillips; Mike Norman(back to camera); Peter Garland. In foreground: Serious discussion between Pugh Phillips (L) & Tommy Taylor about an Inter-House rugby match Deanery v. School in 1960!